Before you even know about its products, you’ve gotta love its name: Neato Robotics. Any kid growing up in the 1970s and 1980s who was a sci-fi aficionado or computer geek has used the word “neato” to describe cool technology at one point or another. The fact that someone incorporated it into a company name just makes sense. 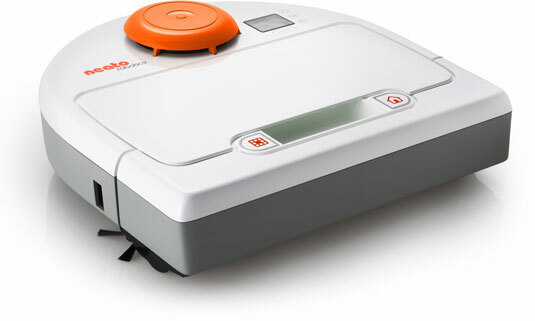 Neato Robotics’ vacuums use a flat edge on the front of their robots, making for a wider brush. That, of course, means it covers more ground. Neato supplies you with Boundary Markers — magnetic strips that you can place on your floor to make a boundary that the Neato ’bots won’t cross over. You can cut the Boundary Markers to fit your doorways and other areas that may need a custom fit. Neato believes in the “bigger is better” approach to some things. The large dirt bin, extra-large filters, and wider brushes attest to that philosophy. Neato has two lines of vacuuming robots: the BotVac series and the XV series. The BotVac series (one of which is shown here) includes higher-end machines with wider brushes, and are, therefore, more expensive than their XV brothers. But honestly, you really can’t go wrong with either model type. These devices have all been praised by the likes of CNET, and you can read a slew of reviews in the News section of the Neato website. Credit: Image courtesy of Neato Robotics Incorporated.